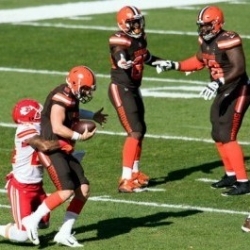 For many, the photo of 2 players arguing over blocking assigments while their rookie QB was still being sacked was a symbol of the Browns’ futility on Sunday. Las Vegas Sportsbooks had a disastrous weekend as several heavy NFL favorites easily covered the point spread. Casual NFL fans tend to wager on the favorites in sports bets, so when the top picks exceed oddsmaker expectations, it can cause a wipeout for sportsbook operators. The action on the Kansas City Chiefs was the pivotal source of angst for most of the books on Sunday. Coming into the contest, the Chiefs were 7-1 with their lone (last second) loss coming to the defending Super Bowl champions, the New England Patriots. The Cleveland Browns entered Sunday at 2-5-1 and coming off a coaching change. The Browns fired head coach Hue Jackson and offensive coordinator Todd Haley. The two veteran NFL coaches had a widely-reported dysfunctional relationship, which is especially bad for a team starting a rookie quarterback. The Chiefs, meanwhile, are led by 2nd-year breakout star Patrick Mahomes, who set the all-time record for the most touchdown passes in his first 3 NFL starts. With a weapons like Tyreek Hill, Travis Kelce, and Kareem Hunt and a big-armed, improvisational style of play many compare to Brett Favre, Mahomes has led the Chiefs to a series of blowouts this year. When the Las Vegas sportsbooks set the line at -8 Chiefs, a whopping 88% of sports bettors wagered on the Chiefs to cover the spread. Sportsbooks like to have 50% on one side of the bet and 50% on the other, but they flourish on casual sports bettors overpicking the favorites. The Vegas oddsmakers would look at the fact the Cleveland Browns were coming off a bye week. That meant they should be rested and healthier with two weeks to prepare for the Chiefs. The Browns also were at home, which typically confers a +3 shift to the home team. Also, NFL teams have a history of winning the week after a coaching change, as if the players are more alert and enthusiastic after locker room issues have been addressed by management. Also, the Cleveland Browns have a talented young roster from years of picking in the Top 5 spots in the NFL Draft. As the team the NFL chose for HBO’s Hard Knocks this year, it’s a team with young stars and more appeal than the standard 2-5-1 team coming off an 0-16 season. The Browns since-waived field goal kicker missed an overtime field goal that would have beaten the Pittsburgh Steelers in Week 1, while they lost 21-18 to the 7-1 New Orleans Saints after leading the whole game (and were one bad call from winning). In short, the Browns were two plays from being 4-4 and, with standout starters like Myles Garrett having a breakout season on defense, the Browns had played most opponents closely this year. The Chiefs/Browns game was only one contest that went against Las Vegas. Bettors also heavily picked the Pittsburgh Steelers to cover against the Baltimore Ravens and the Minnesota Vikings to cover against the Detroit Lions. The Steelers/Ravens are one of the great rivalries in the NFL and those games usually are close-fought contests. The Lions were a playoff team last year and they were coming off a bye. Detroit traded Golden Tate at the trade deadline, but they also had a young Kenny Golladay who had been outproducing Tate. The bettors looked at a surging Steelers team and a tough Vikings defense and picked the favorites. Unlike many weeks, the favorites performed beyond expectations. Thus the bettors crushed Las Vegas sportsbooks to the tune of $7 million to $10 million this week. Of course, anytime the bettors gain the advantage on sportsbooks for a week, the oddsmakers and executives complain about it loudly. It’s a form of advertisement for the next week of betting, because it reminds the casual sports bettor they might be smarter than the oddsmakers after all. Handicappers (professional sports bettors) have a talent for analyzing betting lines and finding soft betting lines. Able to pick a handful of contests they think are exploitable, handicappers might be able to bet the spread consistently. Even then, it’s a professional against a professional and the oddsmakers get an advantage called the juice or vig (short for vigorish). Oddsmakers have to set lines for hundreds of bets a week, so a few lines might be soft. Still, it’s hard to beat a sportsbook, even for the professionals. For the casual sports bettor who goes with hunches or bets on the big favorites, the house is going to beat them, if the house can keep the game going on long enough. Those fans who bet on the Chiefs, Steelers, and Vikings this week are likely to be disappointed next week. It’s good advertisement for Jay Rood, Jeff Davis, and Jason McCormick to talk about the $7 million to $10 million they lost this past weekend.